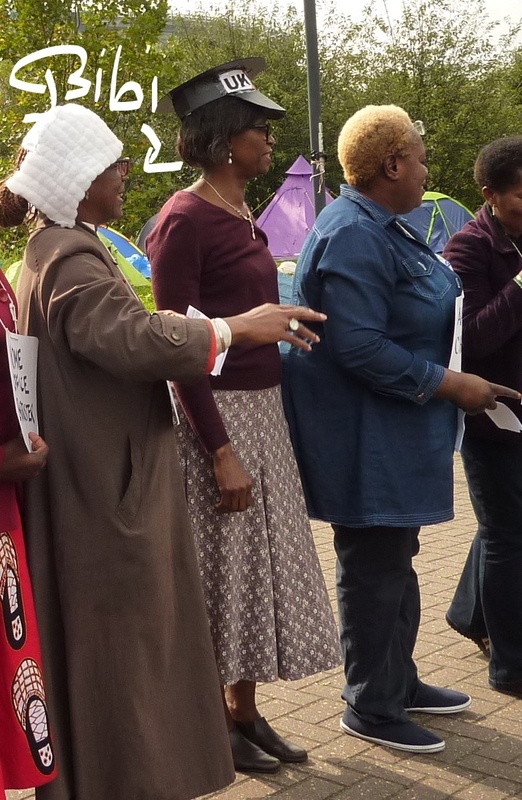 Bernadette Mappa Kouame Agyei (Bibi) was detained at Yarl’s Wood IRC last Friday. Just the day before she performed to great acclaim the role of a judge in our play ‘WE ARE HERE BECAUSE YOU WERE THERE” at the DSEI – Stop the Arms Fair. The day’s theme was Free Movement for People not Weapons! Now Judge Bibi, who has an appeal on 1 December, finds herself denied the right to a hearing in front of a judge because the Home Office plans to deport her back to Cameroon! Bibi Agyei is a kind and respected member of our group, the All African Women’s Group (AAWG), a self-help group of women seeking asylum which is based at the Crossroads Women Centre in London. Once a fortnight, 90-100 women from different countries come together to discuss our legal cases, share experience and support each other. Bibi has helped other women to understand and fight their legal cases, especially those who do not speak English. Bibi has been in the UK since 1996. Her children and partner all live here and are British citizens. She has no-one in Cameroon and fears for her life if sent back there because of her political activities. Her 22 year old son died in 2014 in tragic and still unclear circumstances on the M11 motorway, while returning to the Norwich School of Art, where he was studying Architecture. Bibi and her family weren’t even informed about the inquest into his death so could not attend — one example of the racism we face as people of colour. Bibi is devastated at the thought that she would not be able to visit his grave if she were deported. These regular visits are the single biggest comfort she draws on to help her through this terrible loss. Bibi is disadvantaged in fighting her deportation case because she was unjustly convicted of being in possession of someone else’s passport. The Home Office is using this to deny Bibi her right to appeal. She wants to challenge this conviction and it is only fair that she gets the chance to do this. Many of us are labelled criminal because we are forced into illegality to survive and support our children because the government makes us destitute. Please write to demand that Bibi’s (Bernadette Mappa Kouame Agyei) flight tomorrow (Thursday 14th September) is stopped. Please see below a sample letter to the Home Secretary Amber Rudd. Please send a copy to her member of parliament, Karen Buck MP and to us at aawg02@gmail.com. I write to call on you to please stop Ms Bernadette Mappa Kouame Agyei’s removal tomorrow evening (14 September). Ms Agyei has compelling compassionate grounds to remain in the UK. She has an appeal hearing on 1st December 2017 which will provide Ms Agyei and her family with their first chance to put detailed expert evidence about their situation to a judge. This includes how much Ms Agyei depends on specialist support which would be denied to her if sent back. Ms Agyei also fears her life is in danger if sent back because of her political activity. The Supreme Court recently ruled that it was unlawful for those with Article 8 family life grounds, like Ms Agyei, to be told they can pursue their appeals from the countries that they have been returned to R (Kiarie; Byndloss) v SSHD  UKSC 42. This is because it has been found to be impossible for people to pursue their right of appeal once they have been removed from the UK. Please do not deprive Ms Agyei of her fundamental right to an appeal hearing. Please ensure that Ms Agyei is released from detention and given a fair hearing. This should not bw happening people who have moved and worked and brought up family’s here should not ne forced to ‘return’to a country they have not beenback to in so long when they face such jepody on thurs return it’s just not right. Bibi Agyei is a kind and respected member of the group, the All African Women’s Group (AAWG), a self-help group of women seeking asylum which is based at the Crossroads Women Centre in London.Please do not send her back. I Ask you not to send her back Please. I have known Bibi for 3 years as a good hearted and helpful person to the AAWG .we are calling upon every one to stand with her to stop the removal today. We love you n pray for you.